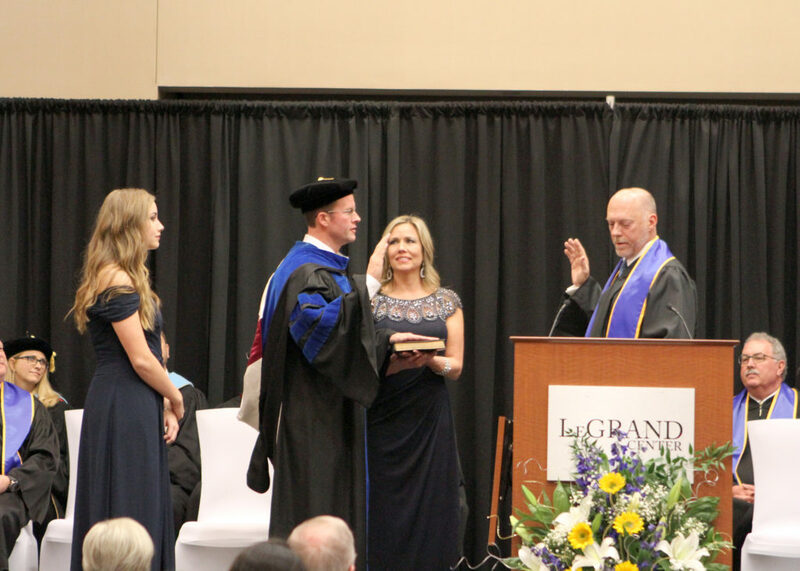 On Thursday, January 24, 2019, Cleveland Community College held an inauguration ceremony to formally install Jason Hurst, Ph.D., as the third president. Wes Westmoreland, chair of CCC’s Board of Trustees, administers the Presidential Oath of Office. Wes Westmoreland, chair of the CCC Board of Trustees, welcomed guests, which included community college presidents from across the state; local and state elected officials; Dr. James Petty, the first president of CCC; and faculty and staff. Westmoreland administered the Oath of Office and presented Hurst with the Presidential Medallion, featuring the College’s seal. The medallion represents the authority of the president’s position. The ceremony featured music by harpist, Lelia Lattimore, vocalist Betty Z. Taylor and pianist, Mike Sisk.